2 nights on weekends. 1 night mid week at peak season rates for one night stays. All dogs are $15/Night. $25/dog for 1 Night Stays on dog friendly cabins. Property Size 575 sq. ft. The Henderson cabin has a deck right on the East Fork of the Wallowa River, so the river sounds will enhance the vacation while you stay in this charming cabin. The deck has a swing on it for extra comfort. 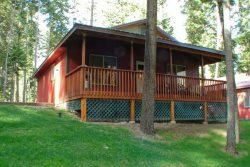 The deck is on the back and is not visible from the road, so you can enjoy privacy while having access to the Wallowa Lake scenic areas and activities. There is also a briquette BBQ that you can enjoy using while out on the scenic deck. This cabin is perfect for a small family of 3 since it has a queen bed and one twin bed! The Henderson cabin is in a great location that is close to the hiking trails and other activities. It is a great place to escape reality in and enjoy a few days in the wilderness without actually having to camp! Come to this adorable cabin and have fun in this beautiful place we call Wallowa County.